THE WRITING BUDDHA - Opinions | Books | Movies: Fearless In Opposition by P. Chidambaram (Book Review: 2*/5) !!! 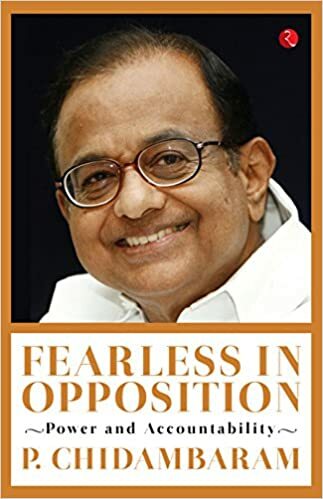 Fearless In Opposition by P. Chidambaram (Book Review: 2*/5) !!! As far as I memory works, I have never read a book written by any active politician. And I believe this has been my best decision ever after reading P. Chidambaram’s “Fearless In Opposition”. The book also has the tagline which says “Power and Accountability”. I had a belief that a politician decides to write a book only when he takes a conscious decision of speaking truth irrespective of either it’s in his favor or not. But after reading Chidambaram’s version of how the current NDA government is working and operating the nation, it seems as if our country is only doing worst each and every hour and there’s nothing good or encouraging happening. This is such a one-sided and disappointing book that you will never want to vote such a discouraging party again in power which has nothing good to say about the current government. Chidambaram has discussed different sectors and topics such as Nation and Nationalism where he talks about caste discrimination, dalit rights, how current government tags people as anti-nationalist as per their criterions; how this government is disconnected from people where he talks again about Dalit righ, fake encounters in the Ishrat Jahan case etc. ; he also talks on the topic of Jammu and Kashmir widely in 6 articles; misgovernance, failures of policies, the state of the economy, union budget of 2016-17, foreign policy and finally in the last section about demonetisation. This book is a collection of all the columns and articles written by Chidambaram in the date range around 2016. Chidambaram has given statistics and graphs wherever he managed to show that his party did well against the current party but wherever there was a scope of the current government doing well than them, he just passed generic statements again showing the current government in the bad light. And this is continuously being done throughout the book and in each column. Whenever there is growth in percentage in any performance against his own government, he has not shied away from terming the growth as “only” or “just”. Trust me, after completing this book, you will feel as if you are living in the worst country possible. He has not even appreciated the government for terrorist attack control if not for anything but mentioned loopholes even there. If you are anti-BJP government and familiar with economic terminologies, go for it. I give this book only 2 stars out of 5.